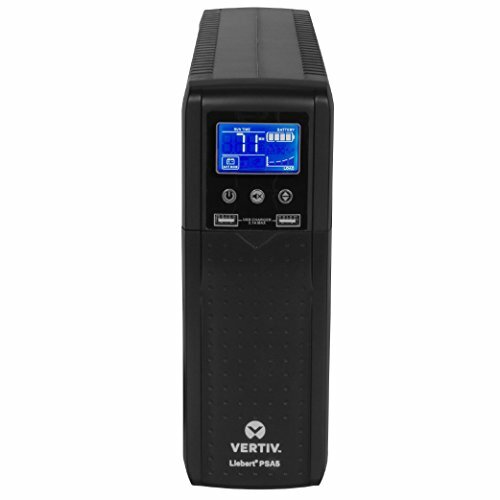 The Vertiv Liebert PSA5 UPS 700VA 420W provides reliable and economical protection for household or business electronics, with battery backup to protect against power surges, brownouts, blackouts or drops in voltage. Vertiv Liebert PSA5 UPS systems are easy to set up and ideal for computers, modems/routers, home surveillance, entertainment equipment, gaming systems and other valuable electronics. Designed with easy controls for user friendly operation, the Liebert PSA5 provides ample run time to save work in progress and shutdown your equipment in an orderly fashion. With built-in USB port, included USB cable and with available MultiLink shutdown software, you can receive remote alerts and complete an unattended shutdown. Virtually every Fortune 500 company relies on Liebert branded products from Vertiv to protect critical systems, which is a testament to our professional-grade engineering. Vertiv backs the Liebert PSA5 UPS family with a hassle-free, no-questions-asked, three-year advanced replacement warranty, which includes the battery and convers all shipping costs. LINE-INTERACTIVE: Conditioning with automatic voltage regulation (AVR) to correct most disturbances without using battery power, providing conditioned power to equipment and extending battery life. OUTLETS: Ten outlets, with five surge-only protected outlets and five battery and surge-protected outlets; USB charging port keeps personal electronics charged and available. MANUFACTURER'S WARRANTY: Three-year, full unit advanced-replacement warranty covering battery and shipping. Next-day delivery to ensure receipt of replacement UPS prior to returning the damaged unit with no questions asked. EASY CONTROLS: Facilitate worry-free operation, with an LCD display allowing users to easily monitor estimated run time, load capacity, battery status and input/output voltage and frequency.